For real Big Island flavor, go beyond the resorts and luaus and head into the fertile rainforests and fields of Hawaii Island. From coffee plantations along the famed Kona coast to specialty farms on the world’s tallest volcano, small-scale producers afford visitors behind-the-scenes glimpses into estate-produced roasts, silken white honey, chocolate made from local cacao, succulent tropical fruits, and even Hawaii-grown vanilla. 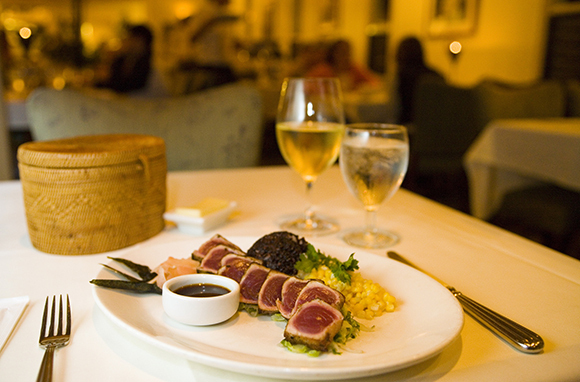 Island restaurants and inns offer even more opportunities to experience the local fare. With so many options, it’s best to create your own self-drive itinerary and explore the island along the way. So visit a local farm, stay on a coffee plantation, dive into the local cuisine, and, above all, hang loose and enjoy the ride. Here’s a sample of some of my favorite food experiences around the island. 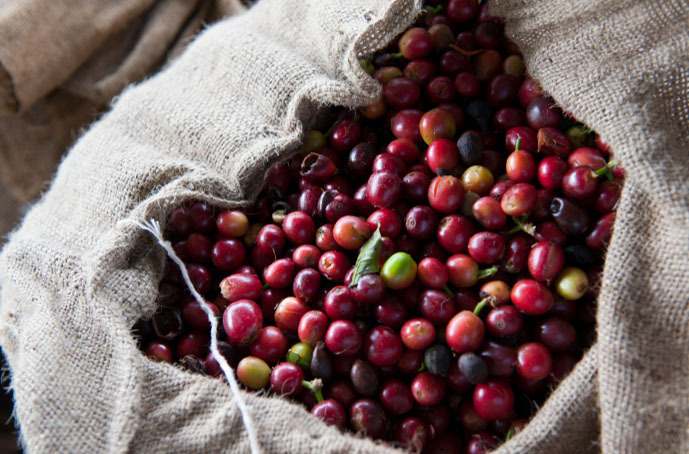 Before there can be a coffee bean, there has to be a coffee cherry. 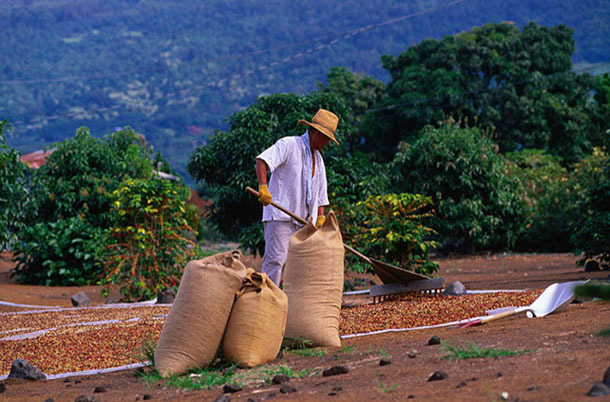 And the best way to learn why is by touring one of the many coffee farms and mills tucked into the volcanic slopes of Hawaii's Kona coast. From Kailua-Kona and Holualoa to historical Kealakekua, towns around the Big Island provide a dynamic combination of continuous cloud coverage and mineral-rich soil. And that means ideal growing conditions for the fruit, which ripens into a deep cherry-red color before it can be dried and roasted into the familiar dark-brown bean. Mountain Thunder Coffee, the largest organic coffee farm in the U.S., is a must-stop along the winding uphill stretch of Kaloko Drive in Kailua-Kona. 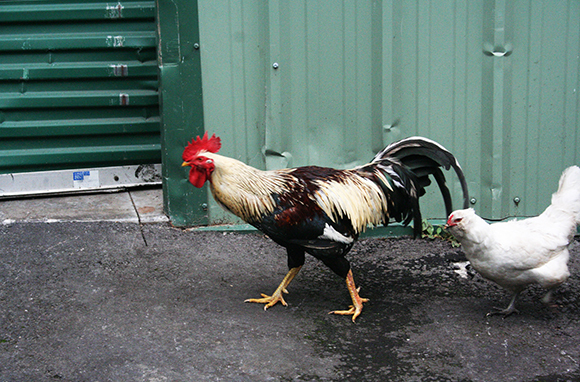 Before visiting the award-winning plantation's roasting facility and sampling its private reserve, follow the chickens crossing the road (no joke) to view coffee trees up close and learn about the growing process. At Greenwell Farms in Kealakekua, coffee cherries are handpicked from 120-year-old orchards (which you can walk though on a guided tour), and workers still rake some of the trees' spoils on old-style hoshidanas, platforms with rolling roofs for drying beans in the sun and protecting them when it rains. To truly drink in Hawaii's coffee culture, book a stay at Holualoa Inn, right off the main drag in the laid-back arts community of the same name. Instantly fall into a state of pure relaxation by walking barefoot in the B&B's airy Zen spaces flanked by calming Buddhas or by kicking back on sleepy lanais that overlook every type of tropical fruit tree imaginable (especially coffee). I stayed in the Coffee Cherry Room, which includes a private outdoor hot tub and a lounge-ready pineapple patch, complete with mountainside views that span all the way down to the distant ocean. 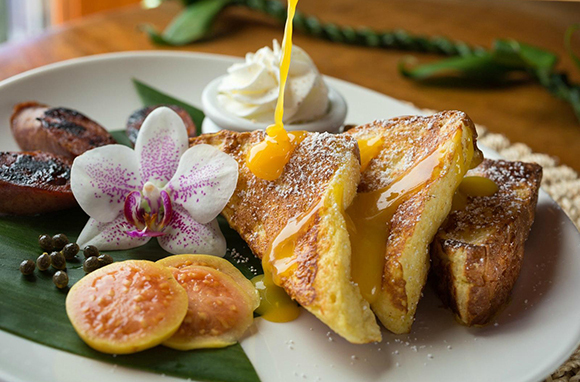 In the morning, a feast awaits with dishes such as lilikoi (passion fruit) French toast with toasted coconut and mini veggie quiches, all made with produce grown on the lush grounds. Owner Cassandra Hazen might call it garden-to-table cuisine. I call it the most delightful breakfast ever. While the property is chill, the accompanying estate-grown coffee comes in "fancy" and "extra fancy" and can be made to order in a French press. Some chocolate companies grow cacao, while others simply transform it into luscious candy. In Kona, on the leeward slope of Mt. Hualalai, Original Hawaiian Chocolate does it all, from tree to bar. According to owner Bob Cooper, the single-origin operation is the first to use 100 percent Hawaii-grown cacao commercially, even though cacao has been grown on the island since the 1900s. 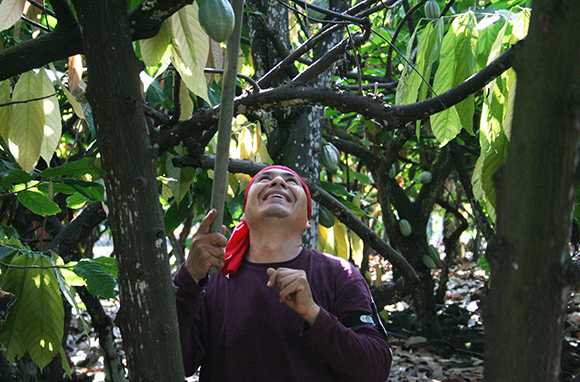 At the farm and factory, 1,350 trees yield a veritable rainbow of cacao pods in shades of red, orange, yellow, and green. You can watch them being harvested by hand and follow the chocolate-making process, from bean fermentation in wooden "sweat" boxes and drying in the Hawaiian sun to conching and winnowing the "liquor" into the velvety smooth substance we know and love. At the end of the tour, try the bittersweet and milk chocolate bars that are tempered and molded into plumeria flowers to symbolize the Aloha state. From the upcountry town of Waimea, drive up Lalamilo Farm Road into the misty rainforest until you come upon a clearing with a series of framed buildings housing the Rare Hawaiian Honey Company. Here, where just about everything is encased in a tangle of large tropical flowers and lush vines, about 25,000 pounds of honey are produced annually. That might seem like a lot, but the company employs the sustainable practice of only harvesting surplus honey, leaving the majority of it to the bees who depend on it for survival. But whatever the bees give us, we are thankful for. 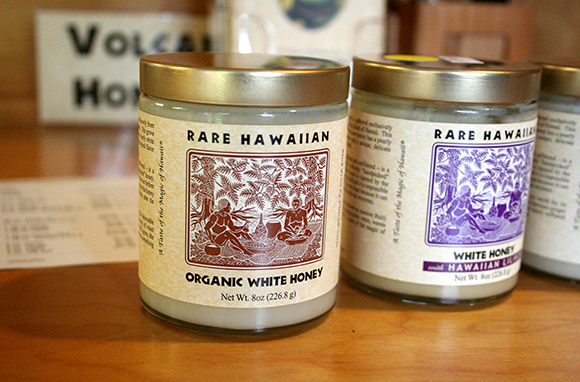 Unlike the typical amber-color liquid commonly drizzled at the breakfast table, Rare Hawaiian's honey is pearly white and spreadable. Made solely from a single grove of kiawe trees, the silky monofloral honey is 100 percent organic and tastes positively ambrosial. Because it's processed without heat and remains raw, healthy enzymes—as well as some bits of pollen and propolis—are preserved, so it's good for you, too. View this process up close by watching workers as industrious as the bees, then sample the whole lineup of flavors, including varieties mixed with lilikoi puree or ginger, or others produced from lehua or macadamia nut flowers. With a flower that blooms just one day every year, calling the planifolia orchid—and the long, skinny vanilla bean it produces—rare is an understatement. 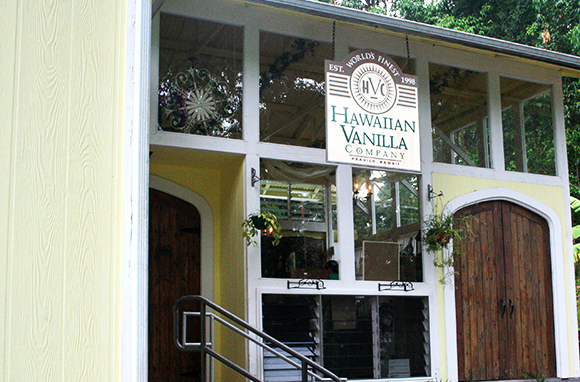 Perhaps even rarer are companies that cultivate vanilla commercially in the U.S.—Hawaiian Vanilla Company was the first. Started by husband-and-wife team Jim and Tracy Reddekopp, the mill, set on 20 acres of rainforest in Paauilo, is a farm, production facility, and cafe all rolled into one. At the mill and restaurant, tours start with a luncheon, at which you can OD on all things vanilla, including vanilla-infused tea, vanilla lemonade, and vanilla bean ice cream brightened with a tart passion fruit sauce. Afterward, grab an umbrella (as it's likely to be rainy) and head over to the farm, where the orchid plants creep up poles anchored inside raised beds. Learn about the technique for growing the delicate vines and how each blossom is carefully pollinated by hand. Once the tour concludes, you'll get a fragrant vanilla bean to take home, which you can turn into a lasting souvenir by using it to make your own vanilla extract. Thanks to year-round mild temperatures, fertile land, abundant rain, and a variety of microclimates, Hawaii Island is basically one giant outdoor nursery. Some have even dubbed it the "breadbasket" of all the Hawaiian Islands due to the sheer amount and variety of food it yields. 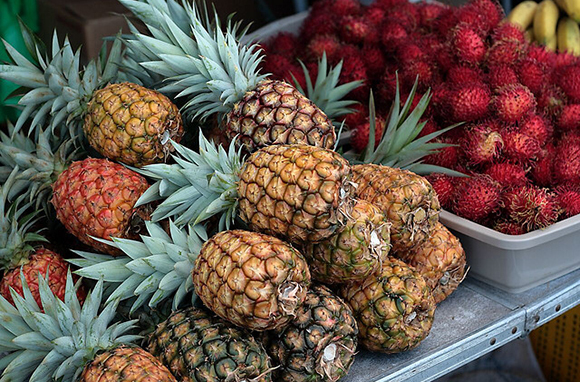 To shop for a vast array of the island's treasured bounty in one central gathering place, drive down its windward side to Hilo Farmers Market in the town of Hilo, set between the bay and Mauna Kea Volcano. On Wednesdays and Saturdays, more than 200 farmers sell their products, much of them locally grown—from vegetables (red bok choy, kale, and taro) and exotic fruits (spiky rambutan, strawberry guava, dragon fruit, and, of course, pineapple) to prepared foods such as Portuguese malasadas (a type of doughnut) and poi. On other days, a smaller group of about 30 vendors turns out, but there's still plenty to purchase and taste. Long before "farm-to-table" became a ubiquitous buzz phrase, a group of island chefs founded the Hawaii Regional Cuisine movement to celebrate regional and ethnic foods that showcase local ingredients: grass-fed beef from Waimea's pastures, sustainably managed fish and seafood, and fresh produce grown in volcanic fields. These culinary pioneers transformed the islands' harvest into elegant, inspired dishes in area restaurants, a concept now largely embraced throughout Hawaii. One of the first and most well-known chefs, Peter Merriman, has been serving a locally sourced menu at his flagship restaurant, Merriman's Waimea, for more than 20 years. From "Dirt Farm Salad Starters" to entrees centered on ahi, mahi mahi, and naturally raised meats, nearly every item has a known origin (detailed in menu descriptions) and hails from nearby farms and waters. I started my meal with "compressed pineapple" over a bed of greens and finished it off with one of Merriman's signature desserts: Velvety Hanaoka Farms Lilikoi Mousse with macadamia nut shortbread cookies. Other island establishments have embraced the Slow Food movement, which focuses on quality and sustainability. Local favorite Holuakoa Gardens and Cafe in Holualoa embodies these principles in the most authentically Hawaiian way: completely low-key. In a garden outfitted with a soothing koi pond, I enjoyed my super-tall avocado BLT (and mimosa) to the soft sounds of a guitarist strumming at the restaurant's adjacent coffee shop. As I crisscrossed Hawaii Island on my self-drive food-and-farm tour, I kept hearing radio ads for an agricultural business-plan contest—sponsored by Kamehameha Schools (in partnership with Ke Ali'i Pauahi Foundation)—to help jump-start a strategy for a more sustainable Hawaii. Kamehameha Schools, a nonprofit organization committed to land stewardship and preserving natural resources, is perhaps at the core of the islands' most important food-related movement, as it aims to bring Hawaii closer to self-sufficiency—reducing its dependency on imported food and increasing local food production—through entrepreneurship (i.e., independent farms and businesses like the ones I visited). And for travelers who want a taste of Hawaii, it helps ensure that there will be plenty of authentic flavors and food experiences for years to come. Quiz: What's Your Hawaii IQ?